A few years ago, Tracey Mitchell’s dad needed to go into a nursing home. Mitchell had no complaints about the care he received, but three months before he died, a surprise arrived via regular mail. It was a lawsuit alleging Mitchell owed $49,000 to the nursing home. The lawsuit came out of nowhere, Mitchell said. Mitchell said she was scared as well as perplexed. The nursing home never sent her a bill, she said, and just as important, she never expected to cover her father’s expenses. Her dad’s facility, Alaris Health at Cherry Hill, through its “fiscal agent” Future Care Consultants, claimed otherwise. Mitchell’s fight against the lawsuit highlights the complexities of paying for nursing home care. And it often comes down to the language in the contract. The odyssey began when Robert Bowman was admitted in October 2015. He was too weak to sign any paperwork, Mitchell said, and she wasn’t asked to sign, either. Mitchell said she told the nursing home her dad had meager assets. The staff instructed her to file for Medicaid on her father’s behalf, so she started the process, Mitchell told Bamboozled. A screenshot the lawsuit filed against Tracey Mitchell about costs from her father’s nursing home stay. About a week later, a social worker asked Mitchell to sign an admissions agreement for her dad, Mitchell said. She did, signing her name with the word “daughter” in parenthesis, documents show. Bowman stayed at the facility for several months before he was approved for Medicaid on April 1, 2016. It would pay retroactively for three months, but that meant several months of his care were not covered. Bowman didn’t personally have the assets to pay the difference, but, Mitchell said, no one at the nursing home indicated there was a problem. Until the lawsuit arrived via regular mail. Bamboozled reviewed the legal documents. The lawsuit alleged the paper Mitchell signed meant she was personally responsible for charges that were not covered by Bowman’s assets or Medicaid. Inexplicably, neither Bowman nor his estate were named in the suit. The clause, Browne said, required a third party to guarantee payment. But Mitchell can’t be held to that, Browne said, because both state and federal law specifically say nursing homes can’t require a third party to guarantee payment. Browne said that meant Future Care didn’t have a case. Had Mitchell not signed, Browne said, the nursing home probably would have filed for Medicaid on Bowman’s behalf, noting Mitchell was never financially responsible for her dad. Browne responded to the lawsuit, saying the law was clearly on Mitchell’s side. Browne also called the lawsuit frivolous, demanding Future Care drop the suit and saying Mitchell was countersuing for consumer fraud. Future Care didn’t drop its suit. To the countersuit, Browne added SCO Silver Care Operations, which owned Alaris, and owner Avery Eisenreich, who is listed as SCO’s owner in a state license filing. The suit alleged Future Care, SCO and Eisenriech, who public records show owns 12 nursing homes in the state, use the “illegal” wording in its contracts to collect from people who are not responsible for their loved ones’ nursing home bills. “My theory is if they sue 10 people like this, they will find maybe one with an attorney who knows the law and nine will pay,” Browne said. Future Care, SCO and Eisenreich are all represented by the same law firm, sb2 Inc. of Harrisburg, Pa., court documents show. The attorneys named in court documents didn’t respond to phone and email requests for comment. We wanted to ask the attorneys more about the case and the 116 companies for which Eisenreich is listed on paperwork with New Jersey filings. 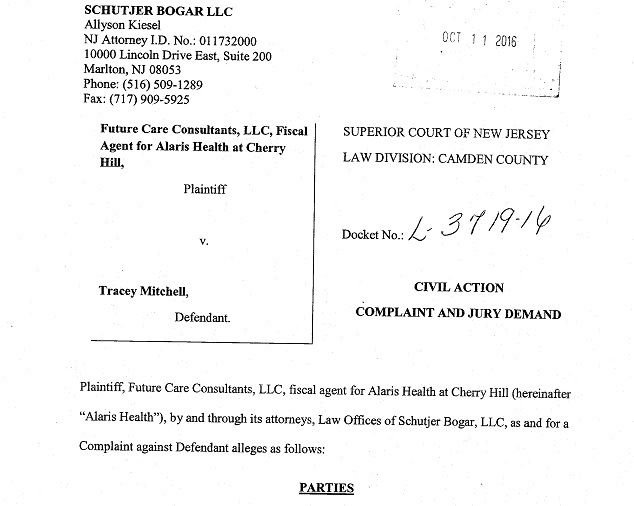 We also wanted to ask about other lawsuits Bamboozled found in public records, including two others against Alaris Health at Cherry Hill, six against SCO, 25 against Future Care and 15 against Eisenreich. Future Care, which has an “F” rating with the Better Business Bureau, also filed dozens of lawsuits in the past 18 months, and we wanted to ask about that, too. But again, the attorneys didn’t respond. Eisenreich didn’t respond to voice messages, either. The case against Mitchell went before a judge last month, and the judge dismissed it in Mitchell’s favor. The judge also awarded $34,000 in legal fees, which Browne said is uncommon in these cases. Mitchell’s countersuit started Monday in Camden County Superior Court, alleging Future Care, SCO and Eisenreich violated the Consumer Fraud Act because of the “illegal” language in the contract and because the initial lawsuit against Mitchell was frivolous. Browne asked for $49,000 – the maximum “ascertainable loss” based on the initial suit against Mitchell – plus treble damages and attorney’s fees, which are permitted under the Consumer Fraud Act. Mitchell said it’s not really about the money, but about protecting unsuspecting consumers. Then on Tuesday, the day after jury selection, something changed. “No comment,” said Browne. “The matter is resolved to our satisfaction.” He added he couldn’t comment any further. To us, that sounds like a settlement in Mitchell’s favor. Moving a family member to a nursing home is an emotional experience under the best of circumstances. If you’re not careful, or if the facility you’re working with isn’t clear about the rules or uses contract language you don’t understand, you could get stuck with an unexpected bill. A December 2015 photo of Robert Bowman’s 80th birthday, out at a restaurant near his nursing home. Pictured are Bowman and his wife, Constance, and their three children Bob, Shannon and Tracey. This is especially true if the patient doesn’t have the funds to pay for a nursing home but is not yet eligible for Medicaid – something that doesn’t happen overnight. The Department of Human Services said on average, statewide, it takes from 34 to 39 days for approvals. Practitioners disagree, saying there is a backlog at many county Medicaid offices, with some running as long as three to 10 months behind. Callahan said as a result of the backlog she has witnessed, some nursing homes will take a patient before Medicaid has been approved. A case like Mitchell’s, in which her father was admitted even though he had not yet applied for Medicaid, is less common, she said. That’s where the importance of the contract language comes in. Family members should never sign anything without reading and understanding it first, said Yale Hauptman, an estate planning attorney with Hauptman and Hauptman in Livingston. Note that a spouse doesn’t have to sign, though the spouse’s assetswill be considered as part of the Medicaid application. The fine print is essential. First, look for the term “responsible party,” which is typically used in facility contracts. Hauptman said the responsible party is charged with paying the bill. “You want it to be clear that the responsible party is responsible to pay the bill from the resident’s funds, not their own personal funds,” he said. Robert and Constance Bowman pictured in 2014, before Robert Bowman moved to a nursing home. Also look for the “guarantor,” which is used when a child or other individual personally guarantees to pay from his or her own personal funds. Hauptman said the contract typically has language that makes it clear that the responsible party is required to file for Medicaid. “If the child in that case does not follow through on the Medicaid process after having agreed to do so – dropped the ball – and the application is denied because all information and documentation was not provided to the caseworker, the facility could look for payment from the child, arguing that the child did not take the steps necessary and diligently follow through with the application as he/she contractually agreed to,” Hauptman said. Then there’s the Medicaid “look back” period, which is the five-year period during which Medicaid will examine the finances of the applicant. If the applicant disposed of money five years before needing Medicaid, he may be ineligible for the time period that could have been paid for by those funds. Given all the complications, it’s worth seeking help before your loved one even needs Medicaid. Working with an experienced elder law or estate planning attorney or with a Medicaid specialist can help you navigate the process, especially if you’re trying to protect assets. “Hiring help can save you thousands in the long run, and it will eliminate common mistakes which cause delays, denials and the tremendous backlog,” Callahan said. For the actual Medicaid application, you can get help for free. Contact County Welfare Agencies (CWAs) and Boards of Social Services, Medical Assistance Customer Centers (MACCs), Area Agencies on Aging (AAAs) and NJ FamilyCare at (800) 701-0710.